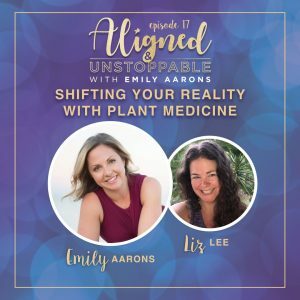 In our 17th episode of the Aligned & Unstoppable podcast, Emily talks with Liz Lee. Liz is a web designer focused on helping Healers, Intuitives, Coaches, and Consultants navigate coming online, having a web presence, and bringing them “online” to their true selves. She shares primarily about her experience on a retreat in Costa Rica and what that meant for her healing work and moving forward. Liz talks about her journey and shares her recent experiences that have been life-long dreams. She talks about what she had to do to prepare for the journey she was about to take. Liz discusses her Quantum Re-write meditation. Emily and Liz dive into what it means to “look back” and time-shifting. She shares about her retreat experience at Rama Organica. Liz talks about how important it is to be aligned with people around and her clients. Liz shares more about her experience in the Ayahuasca ceremony. Liz talks about resistance and what to do with it. She shares about one of the top 5 best experiences of her life, Nauyaca Falls. Liz shares 3 words that spoke to her. It’s important to be aligned with the people around you and your clients. We have to re-learn who we are and connect with a greater intelligence. Get out of your routine, get out of your element and experience something different. “One of my lessons now is to learn the importance of surrendering, consciously surrendering to my experience to life.” – Liz Lee. 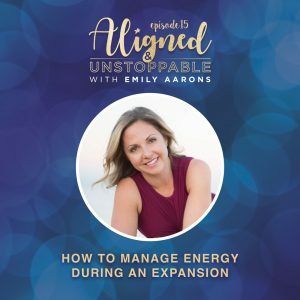 During this episode, Emily shares about what expansion is and how to recognize the impacts of an energy expansion within ourselves. She shares some insights into recognizing what is occurring in your body, and how to manage those expansions when they occur. What do we mean by Expansion? Our Physical bodies are slow to catch up to changes after an energy expansion. Even though we have done the healing in a certain area, we are always expanding to a new level. The physical body actually resists the expansion. Managing the shift and change is key. Our energetic up-leveling shows up in various ways. Take some moments to examine what is occurring at the moment, to allow you to see the resistance to expansion. People around you are feeding off of your energy. Look for all of the levels of resistance, and what you can you do about them. If you are holding yourself back, you and everyone and everything around you is affected. You must take some rest, shut things down, and listen. I share some questions to ask yourself about how to listen to your body. Join our member group and Thank you! There’s always an “expanding” to a new level that is occurring. It’s all about how we can care for ourselves on a whole new level. Feel into your expansion, and ask what it is that your body requires right now to fully express yourself. “We actually have to let go of who we have been up to this point, each and every single day so that we can expand into who we want to become.” – Emily Aarons. 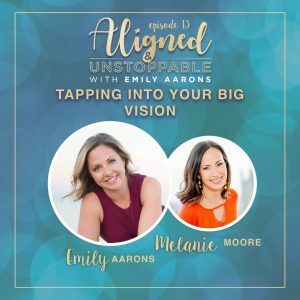 In our 13th episode of the Aligned & Unstoppable podcast, Emily is joined by her good friend Melanie Moore to discuss her journey and how she came to start Big Vision TV. Melanie talks about her love for helping people see their “big vision” and moving past the fears and barriers to take action toward their vision. She shares about the amazing benefits of EFT and “tapping” into your greatest self. Melanie talks about her heart and “super power” being about helping people tap into their big vision. She decided to stay home, raise kids, and then ended up starting her own business. Melanie found interest in energy work, reiki healing, and reflexology. Then moved into EFT and Tapping (which she still does), and then into coaching. She realized after doing some Facebook live and Periscope interviews, that she wanted to start her own TV show, and that’s how Big Vision TV on YouTube was born. Fears can really keep you from actually starting things. The internet has opened up the world for connection and for starting a business. Before the internet, even in recent years, most connection happened in “brick and mortar” locations, and now connections are happening through online platforms. In 2015, Melanie wanted to take her local business global. Because of new apps, like Periscope, she was able to take her sessions online and that was the beginning of the growth of her online platform. Melanie shares more about tapping into your big vision. She had to learn to live her full life. She realized how the past has brought her to where the universe wants her and into her current platform of sharing with the world. Emily and Melanie discuss EFT (Emotional Freedom Technique) at length, and about how we store things in our bodies that “tapping” allows to be released. Melanie shares about her first experience with Tapping and personal story about a trauma from when she was 3 years old. You can utilize “Tapping” technique in a variety of areas, to release you to be who you are meant to be and thrive. Don’t let fear and your past negative experiences hold you back from your higher self. EFT is an incredible way for you to “tap” into your big vision and all the limiting beliefs that are keeping you from that vision. Address those fears, because we’re not here to play small, we are here to do big things! “That fear actually stop you from getting started from doing anything.” – Melanie Moore. “When you tap into your highest self, what does that look like?” – Emily Aarons. “We are emotional beings and we’ve got these emotions for a reason.” – Melanie Moore.